Comparative Video 101: Dylan's "One Too Many Mornings"
Dylan's "One Too Many Mornings"
Bob Dylan will turn sixty-nine in May of this year, not a significant milestone like a decade birthday - except, perhaps, to those of us who remember the scruffy look and baby face of the cover photo on his first record album on Columbia in 1962, closing in on fifty years ago. It's just as hard imagining the enfant terrible of the Greenwich Village folk sub-culture as a senior citizen as it is finding oneself knock knock knocking on the same door. It's also sobering to realize that Robert Zimmerman, Little Richard wannabe, began his personal reinvention and by many accounts self-iconization as Bob Dylan, folksong poet and reluctant prophet, nearly half a century ago. He has over the course of the decades developed a core following of rabid Dylanistas, fans from several generations who believe him to be the greatest (fill in the blank with your favorite category) of the 20th century. Uttering a word of criticism of Bobby Z. will draw the ire of maddened legions of those fans, which makes a proper assessment of what he actually has accomplished difficult. But time will eventually take care of that, and may well have done so already. I'm reminded of a comment made by Irish actor Peter O'Toole on the Charlie Rose Show a few years back, I believe around the time of his last Academy Award nomination. O'Toole has been a frequent and often prickly guest on Rose's program, so I winced a bit when Charlie waded right in with his first provocative question - which was to the effect, "You know, Peter, when they finally publish your obituary - you know what the lead is going to be - it'll be Lawrence of Arabia. How does that strike you?" To his everlasting credit, O'Toole replied without so much as a blink and with consummate graciousness, "That will be just fine with me. I was lucky once in a lifetime to have such a role." Rose's point, of course, was that Lawrence was very early in O'Toole's career, and all of his subsequent work has been measured by and in the shadow of that great performance in what many regard as one of the best films ever made. Thus may it be with Dylan. He continues to write and perform songs of what the Pulitzer Committee described in its citation of his work (again, not an actual Pulitzer Prize) as "lyrical compositions of extraordinary poetic power." But when they finally publish Bob's obit, you know what the lead is going to be - it'll be "Blowin' In The Wind," or "folk poet of the 1960s." And why not? Despite the revisionist critics who would have us believe otherwise, those early albums and songs retain a sublime relevance and impact. Dylan's best political songs, like "In The Wind" and "The Times They Are A-Changin'," are not specific to a single time or cause but are universal - and that is a hallmark of legitimate art, art that transcends simple and temporary pop culture, which is what much of Dylan's output has been since the 60s. 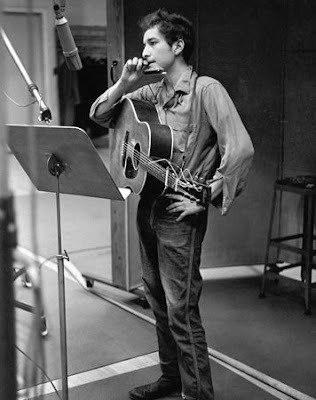 And Dylan is rivaled only by the early Paul Simon as the folk songwriter of urban alienation - songs like "Positively 4th Street" and "Like A Rolling Stone" and what may be the song whose lyrics give him the best shot at being regarded by serious critics as a real poet, "Desolation Row." Dylan shows a fine rockabilly sensibility here, and a spot-on-pitch singing style. No question though in this video as to who the superstar is, and it ain't Bob, babe. Those of us who saw the Trio on their 1966 farewell tour well remember this as the second half opener - a thrilling moment and a great performance in my memory. And just for fun - teen idol Bobby Sherman (remember him?) and actor Rex Harrison's son Noel, who had a brief career as a cabaret-style singer in the 60s. I hope that Bob Dylan's obit won't be published for decades yet. But I also hope that he could respond to a question about it with O'Toole's grace - that if in fact he is best remembered for something he achieved when very young - that he too will be able to respond, "That will be just fine with me." You need to get your chronology correct. The electic version of "One Too Many Mornings" is from May 1966, not "four years" after the 1963 version, and the version with Johnny Cash was recorded in February 1969 during the Nashville Skyline sessions. How on earth could you think that video is Dylan from 1965, pre-Newport! Just look at him. I really enjoyed that. "One too many mornings" is one of my all-time Dylan favourites. Thank you!! @bokhara - corrections made. One was simply late night arithmetic, but the incorrect dating of the Cash show was from the person who uploaded the performance to YouTube and supplied the 1965 date. As to how I could have thought etc - I saw Dylan performing in New York and Chicago and elsewhere four times in 1965. I interviewed him for our local paper. He looked exactly as he does in this video. And three of the four times were months before Newport. Hey Mr. Lee - Thanks for the links! I've been dying especially to hear Burl Ives do the song!If I can I'll add it here. Learning Music - a band from Los Angeles - just recorded a cover of this song during a live in-studio performance. You don't "need" to do anything. For crying out loud that was ridiculous. Would you say that to someone's face? Anyway, saw your link on ER. Enjoyed the Dylan vids. @johng - thanks for the link and I'll check it out - always interested in finding good new LA bands 'cause I live here. @DBF - well, corrections of fact are always welcome, even if (as you note and we both know) folks tend to be less civil behind the cloak of anonymity than they normally would be in person. Glad you liked the Dylan vids - there are maybe a dozen more of Bobby D. doing "Mornings" different ways with different partners. That's one thing I've always liked about Dylan - he never stays in a rut and is constantly reinventing his own songs, usually brilliantly. The Association had a minor hit with the same song, believe it or not. Their harmonies worked well with the chorus. "Good News, Chariot's A-Comin' "
Bob Gibson And "To Morrow"
From South Africa: "Mangawani Mpulele"